Morrow and I discussed his latest two novels. The Last Witchfinder concerns a brave 18th century woman who teams up with Ben Franklin to discredit her zealous father’s persecution of witches. The Philosopher’s Apprentice is the fantastic-science tale of a graduate student hired to teach morality to a teenage girl with a blank slate for a conscience. Bill: You once said it took eight years to develop The Last Witchfinder. When you are writing a book, do you ever worry that someone else will have a similar idea and “beat you to the punch”? Is there a battle between taking your time to get it right vs. getting it published before someone else steals your thunder? James: For me, the greatest pleasure of writing novels is living inside the same fictive world for several years running, playing with its possibilities. The composition process normally finds me drawing inspiration from the cultural mood of the moment, though by the time the book actually sees print that same cultural mood will have shifted. I can easily imagine some posthumous biographer noting that James Morrow always managed to be slightly out of phase with the zeitgeist. A similar fate befell The Last Witchfinder, which features an unusual fictive take on Benjamin Franklin. While I was writing that novel, the country in general and Philadelphia in particular were gearing up for a Franklin tricentennial — he was born in 1706 — and I had high hopes that these celebrations would offer me some promotional opportunities. Alas, by the time the book appeared, late in 2006, Philadelphia had been “Ben Franklined out,” or so my publicist was told by an impresario who had spent the past two and a half years organizing Franklin festivities throughout the city. James: When I read your question, Bill, my answer was immediate and instinctual — and yet I’m prepared to defend it. The Revenge of Frankenstein is not as scary as The Curse of Frankenstein, as cleverly plotted as Frankenstein Created Woman, or as emotionally wrenching as Frankenstein Must Be Destroyed. And yet it has a cadaverous elegance not found elsewhere in the cycle. Director Terence Fisher and writer Jimmy Sangster suffused The Revenge of Frankenstein with a graphic sense of the unhallowed Nietzschean bravado, at once diabolical and darkly glamorous, through which the medical profession established itself in the Regency and Victorian periods. This is a wholly subjective reaction, of course, doubtless informed by the fact that I first saw The Revenge of Frankenstein when I was only thirteen, an age when horror movies are especially resonant. Bill: In his book, The Art of the Novel, Milan Kundera speaks of “the truth that is to be discovered,” by which he means that, beyond a writer’s conscious realization of their novel’s theme, there is also, as Kundera says, “The poem hidden somewhere behind.” Kundera calls this discovering of truth in one’s own novel “the dazzlement.” Do you experience this dazzlement when you write a book? That is, of discovering a theme or a variation on your intended theme, which you did not anticipate? James: I regard most of my novels as “thought experiments,” analogous to the Gedanken calculations –unstageable demonstrations conducted entirely within the confines of one’s skull — routinely performed by physicists, cosmologists, and philosophers. It’s never enough simply to ask, “What if?” You must actually run the thought experiment. You need to write the damn book. And that usually entails being surprised by the outcome. Bill: Besides the 8mm movies you made in high school, you also made some 16mm films as a young adult. Could you tell me about those films? James: Most of these films were sponsored efforts celebrating the Philadelphia Cooperative Schools Summer Program, which ran for four successive summers between 1966 and 1969. The idea was to bring together adolescents and pre-adolescents from the public, private, and parochial schools – students, in other words, whose formal educations had heretofore allowed them to interact only with people from similar backgrounds. Nobody was claiming that the racial, economic, and religious diversity of the PCSSP students would prove enlightening per se, but the program’s directors did believe that if you led such a heterogeneous group through a carefully structured humanistic curriculum, they would learn as much from each other as from the formal lessons. I would describe the movies as poetic documentaries that attempted to show how the students grew in self-knowledge over the course of each summer. You’ll find vestiges of my PCSSP experience in The Philosopher’s Apprentice. James: I must confess to a certain ambivalence toward cyberpunk. On the one hand, the movement was certainly a breath of – not fresh air, exactly – gritty air, I guess. Gibson, Sterling, Shirley, Cadigan, and company recognized that, for most citizens on planet Earth, the future was not going to be a gleaming utopia of domed arcadias linked by hyper-efficient monorail systems, nor would it be characterized by off-the-shelf jackbooted dystopia. Something else lay in store for us, something urban, grungy, corporate, computer-driven, world-weary, hard-bitten, and alluringly noirish. The cyperpunk vision was a real breakthrough, and I salute it. That said, I have always been much more in the romantic-rationalist camp. It’s difficult to find much affirmation in cyberpunk. I felt that the movement contained the seeds of its own enervation – a kind of unearned cynicism verging on adolescent whining. Nihilism, I find, is often sentimentality by other means. Of course, I’m as vulnerable as anyone to the glamour of the abyss. Several critics have argued that my second novel, The Continent of Lies, features some Gibsonesque conceits, most especially in its use of what we would now call virtual reality. As for The Philosopher’s Apprentice, while it indeed contains some hi-tech cyberpunkian imagery (the ontogenerator is the most conspicuous example), I would say that its sensibility is ultimately humanistic. James: I’ve always been wary of Christ figures in fiction. It’s too damn easy to create parallels between your protagonist and the hero of the Gospels. Much as I love John Irving’s work, I really thought he dropped the ball with A Prayer for Owen Meany. Beginning with that inversely symbolic name (get it? ), in the very first chapter, that damn kid jumps in your lap like a puppy, licks your face, and says, “I’m so eccentric, I’m so vivid, I’m so wise, I’m so pure, I’m so Jesus-like, love me, love me, love me,” and it never lets up, for 543 pages. I much prefer The World According to Garp and The Cider House Rules, two edgy masterpieces that never try to sell us on the presumed transcendent truth of the Christian argument. These are strange words, I know, coming from a man who would write a novel like Only Begotten Daughter, which at one level is a sequel to the New Testament. My only defense is that I had some dark, sardonic, passionate, and satiric things to say about the ministry of Jesus, and I could dramatize these ideas only through a kind of low-key allegory. As for The Last Witchfinder, I swear to God, I never thought of Jennet Stearne as a Christ figure until well after the first draft was written. But I think you’re on to something, Bill. My heroine’s fascination with Barnaby Cavendish’s Museum of Wondrous Prodigies, her embrace of those poor bottled freaks – those unblessed people, as you say – does indeed suggest Jesus comforting the damned and the downtrodden. I’m also realizing, for the first time, that Jennet’s love for the deformed embryos parallels a scene in which Julie Katz, protagonist of Only Begotten Daughter, journeys to hell and helps her half-bother, Jesus, give the gift of oblivion to damned souls. I love James Whale’s The Bride of Frankenstein, so I imagine that Dr. Pretorius’s bottled homunculi may have influenced Barnaby Cavendish’s museum, though I wasn’t conscious of this parallel at the time. 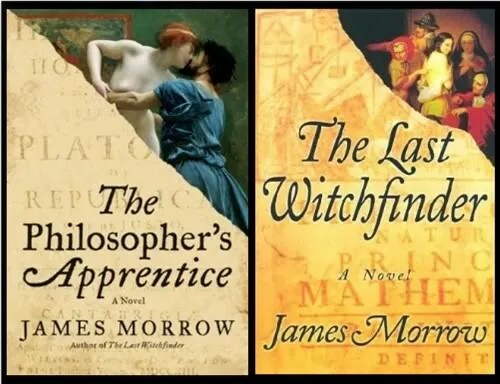 It just now occurs to me that the Last Witchfinder embryos foreshadow the immaculoids – the “adult fetuses” in Philosopher’s Apprentice. I guess a novelist is always stealing from himself. Curious, I rose and picked my way across the salt water pond, one stepping-stone at a time, then leaned toward the mangrove’s trunk. Fascinating and chilling. Was the mangrove mainly a mood-setter, or a metaphor for something? Forbidden fruit? Still sentient? Maybe a foreshadowing device? Or just an interesting and creepy addition to the story?